Are you a South East dealer stocking 10 year old BMW 3 Series'? Then you might just find yourself in demand this summer. That's according to the latest consumer car buying report released last month. An analysis of online consumer car buying habits from January to June 2015 shows a clear preference for the BMW 3 Series as the most in-demand second hand car that internet shoppers are searching for. Ever popular, the 3 Series is one of those cars that many people dream of owning. It is desirable, aspirational and has a very high image. And what’s great for consumers is that they’re now more affordable than ever. The much-loved Volkswagen Golf comes in second as the most sought after second hand car being searched for online. 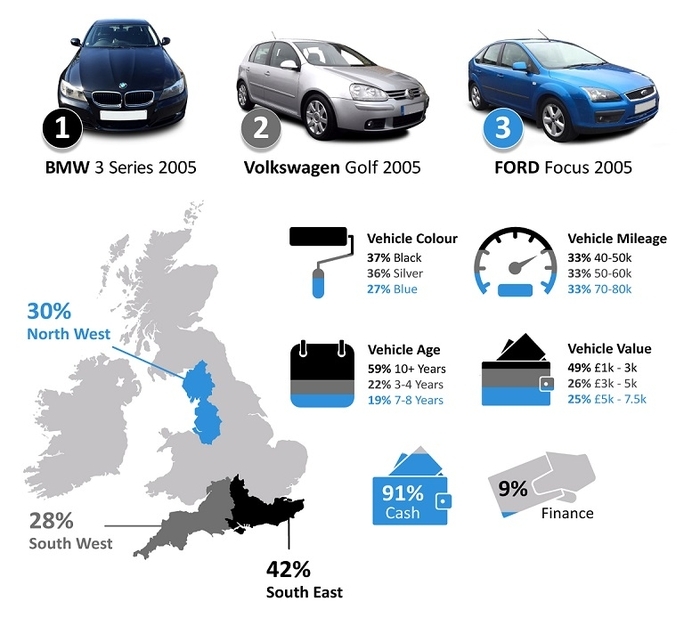 Third favourite is the Focus as the nation's love of Ford continues. When it comes to colour, there's not much to choose between the top three. Black, silver and blue continue to be the most popular colour choices, as reflected in this year's online search habits. No big surprises here; the ‘safe’ colours have come out on top. What aged cars are people looking for? Perhaps surprisingly, older cars are seeing more interest with a majority of online shoppers looking at cars 10 years or older. There is a correlation here with the most popular car being searched for - the BMW 3 Series - as the more premium, expensive models become afforadable with age. How much are people wanting to spend? A half of all online searches between January and June this year have been for cars in the £1,000-£3,000 bracket. This seems to be the second-hand 'sweet spot' and the preferred amount shoppers want to pay. Interestingly a whopping 91% of people have indicated a desire to pay cash, with only 9% opting for finance. Does your stocking policy cater for these preferences? Clearly we can see that stockists of BMW 3 Series' will continue to have consumers knocking on their door. Older models (10 years+) retailing at £2,000 present an affordable option for people wanting to buy a prestige brand. The 'safe' colour choices - black, silver, blue - remain in demand and are a sensible choice for dealers wanting mainstream appeal. Throughout the year we've seen the popularity of second hand Volkswagens, Fords and Vauxhalls grow: If your stocking decisions include Focus', Fiestas, Corsas and Astras then this reflects online buying preferences nicely. Look out for regular CAP Extras updates as we keep you informed of consumer buying behaviour throughout the second half of 2015. *Data compiled from CAP's online consumer valuations January-June 2015.